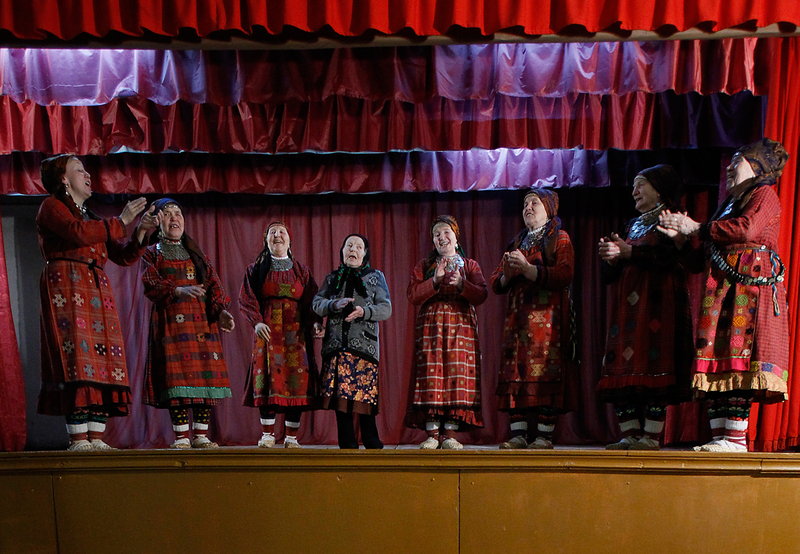 Members of the singing group "Buranovskiye Babushki" rehearse in the village club in Buranovo in the central Russian region of Udmurtia. The folk ensemble of singing grandmothers from Central Russia have recorded a song for the upcoming soccer tournament, which will take place in the country in two years' time. The Buranovskie Babushki folk ensemble have presented a video for their song "Ole-ola," dedicated to the upcoming 2018 FIFA World Cup, which will take place in Russia. The singing "grandmothers" from come from the village of Buranovo in Udmurtia (750 miles east of Moscow) and become popular with the international public after the 2012 Eurovision Song Contest in Baku, Azerbaijan, in which they came in second place with the song "Party for Everybody." The song was officially presented on Sept. 18 in Samara before the seventh round of matches in the Russian championship. The video was recorded in the Metallurg Stadium in Samara. The Buranovskie Babushki, who were born between 1935 and 1968, not only sing and dance, they even play football. "Make us happy with your goals, the grandmothers are with you, and whoever has been silent sing along with us," chant the ensemble. The song names all the Russian cities that will host the 2018 World Cup matches.